For those times you just have to spray the flies away. "I know this is insect repellent and not aftershave lotion. If you were a large animal Vet you'd understand." While this is a funny RMM Vet cartoon to make our point, NEVER spray yourself with Pyrethroid fly spray. Sometimes you have no choice but to use spray to protect your animals and yourself from pesky and potentially harmful insects. You should not have to spray very often for House Flies and Biting Stable Flies if you are using Fly Predators, unless you are away from your property or started them late in the season. However, Fly Predators do not affect all the other insects that might be in your vicinity so we’ve always said it’s OK to spray, but do it appropriately. For 2019, we are introducing Bye Bye Insects Fly spray. Our goal was to create a product that was as effective as the best pyrethroid synthetic pesticide products, but only using ingredients that met the EPA’s 25(b) Minimum Risk criteria. To our knowledge and testing, Bye Bye Insects is the first to accomplish that goal. Bye Bye Insects has a pleasant scent and can be used on humans and horses. Most popular Pyrethroid pesticide based fly sprays were registered in the 1980’s and 1990’s. UltraShield Red is an exception, it was registered in 2011. All these products require registration with the EPA. Our goal was to create the best fly repellent, not just the best Essential Oil one. In the past, Essential Oils never kept up with Pyrethrins in performance. I definitely enjoyed the smell and effectiveness! Besides matching performance of Pyrethroid sprays, Bye Bye Insects also smells and feels terrific. Pyrethroid fly sprays warn against use on human skin and few people like the smell of them. 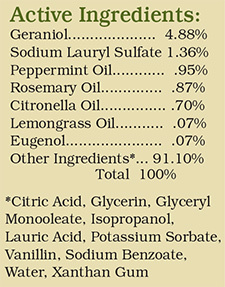 By comparison, Bye Bye Insects has a pleasant scent and can be used on yourself, your family and your horses. We’ve been working on Bye Bye Insects since 2016 and are still improving it. As of October 2018, this has involved testing over 30 different formulations, with 6,000+ equine fly counts in 6 field studies conducted in two states. Bye Bye Insects has been tested for repellency with House Flies and Biting Stable Flies. Bye Bye Insects’ performance on horses was also measured by surveying almost 1,000 early release customers. Of those responding, 44% said it worked better and 45% said it worked the same, as their current (mostly Pyrethroid) fly sprays. 47% said Bye Bye Insects would replace their current spray, 41% said maybe it would. This was before they knew how cost effective Bye Bye Insects was. 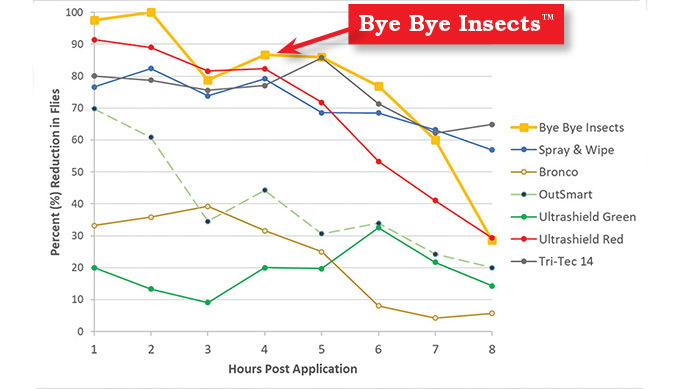 Looking at the graph above of fly repellency, note that Bye Bye Insects (Yellow) has comparable repellency to Farnam’s Tri-Tech, Absorbine’s UltraShield Red and Pyranah’s Spray & Wipe, three of the “high end” Pyrethroid based sprays. Bye Bye Insects performed far better than the other Essential Oils sprays like Absorbine’s Ultrashield Green or SmartPak’s OutSmart. These tests were for Biting Stable Flies which are harder to repel than House Flies. Chart data as of 10/20/18. Test protocol and full data can be viewed by clicking the links. needed. We expect many will find a 50% dilution will still provide sufficient repellency. But it can be used at full strength. On your first bottle, use the full strength until half is gone, then refill with tap water. In our tests, half strength lasted roughly 1-2 hours less than full strength. After you use up your first quart ($22.95 delivered) don’t throw it away. Instead refill it from our 3 quart refill pouch that will be available April 2019. The 3 quart pouch is $44.95 delivered so each full strength refilled quart is only $14.98. Diluted by half it’s just $7.49 per quart. That’s the lowest cost on the market, delivered, for far better performance than low-priced sprays. Have We Made The Perfect Spray? Getting close but not yet. One issue is with slight yellow staining on white and grey hair. If used lightly, the staining is minimal and will wear off. Other than on white and grey horses, this is not noticeable. I have tested Bye Bye Insects repellent fly spray and am so pleased you can quote me. This is the most effective product of the many we have used on our horses and mules. Absorbine’s UltraShield Green and Red, Farnam’s Tri-Tec14 and Bronco, Pyranha’s Spray & Wipe, SmartPak’s OutSmart, Spalding’s Bye Bye Insects are trademarks of those respective companies.